You are currently browsing the Archaeofacts.com archives of Musings for the day Friday, September 29th, 2017. I had another medical adventure today. I saw a podiatrist to get personalized arch supports/shoe inserts made. The surgeon wants my arch properly supported so his fine work inside my foot is never compromised. 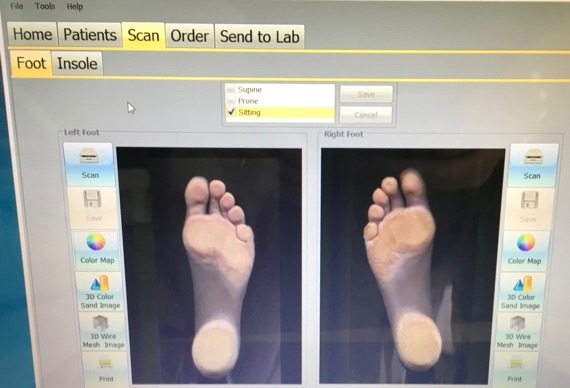 The step today was a special scan of my sole. The scanner produced a photo, and a graduated-color map like some topographic maps, with the “elevation” displayed in colors ranging from deep blue (low) to rusty red (high). We weren’t fast enough to get a shot of the latter. This latter 3D data will be used by what was described as a 3D printer to make the arch support. The arch part will be incorporated into an heel-to-toe innersole that I will use instead of the one that comes in the shoe. I’m told closed shoes only, not dress shoes, so just athletic shoes. Stylish!